This is not only a resupply point, but it is a true milestone on a PCT thru-hike. When hikers arrived at the store during the years of our thru-hikes, everyone out on the porch would applaud them…pretty cool experience. Kennedy Meadows can feel like a zoo at times, especially in the earlier part of the season, as some hikers wait out winter-like weather at KM instead of heading out into the Sierras. Most (if not all) hikers send a resupply package to the KM store (some folks include ice axes and/or crampons in their resupply boxes). You could probably resupply at the store, but it would end up being pretty expensive. Best to plan on just buying snacks in the store to eat while you are hanging out at KM. For those planning to buy items on Amazon to have shipped to KM, try to get your order shipped in one box (this may require ordering from a single seller on Amazon or shipping to a friend or family who then repackages into a single box). We met some hikers who had Amazon orders shipped in multiple boxes, and since you pay a “per package” holding fee at the store, you want to limit how many boxes you will have to pay for. Kennedy Meadows has free camping, pay showers and the best pancakes Beardoh has ever eaten (their burgers are also really good!). Going fast/Moderate pace – Everyone stops in here since it is right off the trail. At least pick up a resupply box (most likely containing your bear canister, as well as any crampons or ice ax you plan to use) and get a nice meal. If you feel like you want to rest before entering the Sierras, this is a somewhat relaxing place to pitch your tent for a night or two. Many NOBO hikers who end up in Lone Pine are probably there because they felt the need to bail out on the winter weather in the first few days in the Sierras. It is just too close to Kennedy Meadows to really make much sense otherwise. There are several trail junctions which lead out to parking lots where you can hope for a ride into town. The drives between the trailheads and Lone Pine are a bit precarious, the folks driving up are camping, hiking or backpacking…you may have to be direct with your hitching request. Once you actually get into town, there are lots of restaurants and lodging options. We didn’t go into Lone Pine in either 2012 or 2016. Going fast/Moderate pace – No need to stop in here unless you are trying to get out of the snow or bad weather. 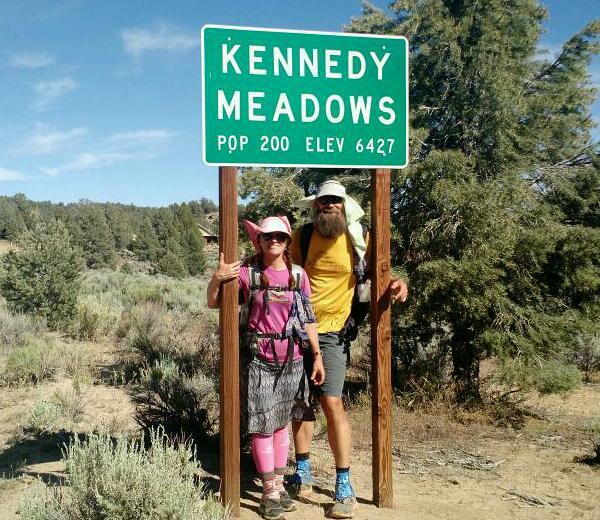 Most PCT hikers go into Independence via the Kearsarge Pass Trail (7 miles long each way). This trail will take you to the Onion Valley Trailhead, where you can try to hitch down into town. It can be feast or famine with the hitches, but we have been very lucky each time we have come through this spot. Occassionally, there are trail angels that will be doing some shuttling, and some entrepreneurial drivers are starting to make a showing in the area as well. Independence is a very small town with several motels, a hostel, restaurants (great taco truck) and a convenience store. There isn’t a great spot to resupply, so you are best to send a package to the post office. OR, you can hitch or take the bus to Bishop which is a much larger town. In Bishop, you will find many motels, a hostel, restaurants and a large grocery store. Both towns are good locations for a zero day. Going fast – You can hike down to the Onion Valley Trail Head, pick up a resupply package, eat a meal and still make it back to the PCT in one (long) day. Moderate pace – This is a good place to get off the trail and break up and otherwise long food carry. This is another way to make it into the town of Bishop or resupply in this area. This trail is 13 miles long (each way) and you will still need to hitch into town from the trailhead. Most folks opt for the trail into Independence and then hitch or take the bus into Bishop. The trailhead gets a good amount of use by day hikers and other sightseers driving up to South Lake (this is where the Bishop Pass Trail meets pavement). Beardoh used this option in 2018 on a JMT hike and resupplied at Parcher’s Resort, which is about a mile from the trailhead. Even though the non-PCT miles are more going in here than at Kearsarge Pass, the Bishop Pass Trail is beautiful and in great shape and should be considered, especially if you want to keep your off trail time to a minimum – you could carry from Kennedy Meadows to Bishop Pass and then on to Tuolumne Meadows. Going fast/Moderate pace – depending on your miles per/day and willingness to carry more food, this could be a good option if you want to stay in the woods longer and avoid multiple hitches. Day 6. Looking into LeConte Canyon from the side trail up to Bishop Pass. 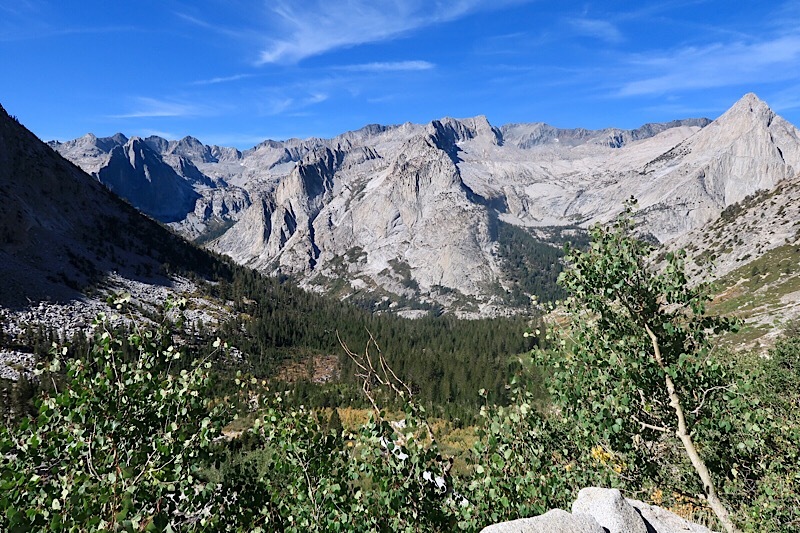 The pros of using Muir Trail Ranch for resupply is that it is well located to keep your food carries small if taking advantages of several of the resupply points through this section of the Sierra Nevada. The negative is the cost of sending the resupply (it needs to be sent in a five gallon bucket) and the cost of them holding your package. The cost is very understandable, as the packages are brought in the horses, but it is still a hard pill to swallow. Some PCT folks think that they can just resupply for free with the extras left by JMT hikers, however, this option has become increasing unreliable over the past few years. With the number of PCT hikers growing and the fact that most PCT hikers are coming through at the very beginning of the JMT season, the fact is simply that there likely will be slim pickings for PCT hikers coming through. 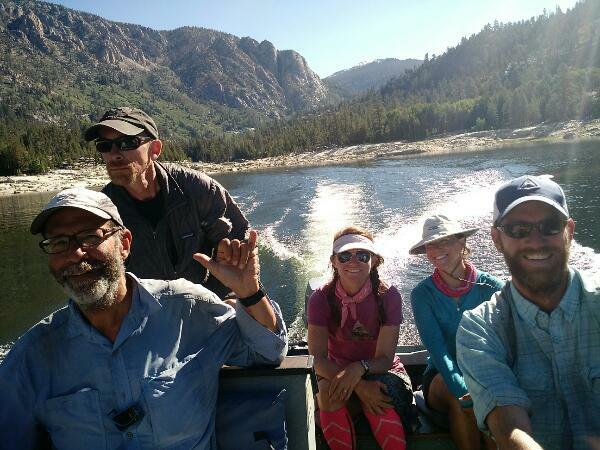 We used the MTR when we hiked the JMT southbound in 2014 and there was a lot of extra food we could swap with the food we had sent, but that was at the end of August, during the height of the JMT hikers and well after the NOBO PCT season. The cabins are quite pricey to stay at, so we have never stayed there. If stopping in here is appealing, you could put together a resupply shipped from Mojave, where you should find a 5 gallon bucket at Karl’s Hardware store and put in 3 hiker’s food and split the cost. Moderate pace – If you are doing pretty low daily miles, it may make sense to send a resupply package here, but if you are able to 20ish miles/day then skip it. This ease of getting to VVR can depend on the water level of Lake Edison each year. In years where the water level of the lake is high, there can be two or more “ferries” per day (basically just a boat or pontoon), but in years with low water levels, the number of ferries can be reduced to one or cancelled all together. At VVR, there is a restaurant and small store, showers, tent cabins for rent and also space for free camping. The food at the restaurant is quite good, but also quite expensive. Many hikers receive resupply packages at VVR, even though there is a high fee for holding packages. We took a nero at VVR in 2016, which was extremely relaxing, since there isn’t much to do there. It is pretty easy to rack up a big bill, even without paying for lodging. Going fast – If the timing works out, you can take the ferry over for a nice meal and then continue on, otherwise skip it. Moderate pace – It is a nice, relaxing place to hang out. If you are worried about racking up a big bill (very possible), include an extra dinner in your resupply box to eat while you’re there. This stop is pretty convenient, as you pop out of the trail at Red’s Meadow. There is a restaurant at Red’s Meadow and you can even send a resupply box there (check out their website, as there is a form you must fill out and send ahead). If you want more of a rest, you can take the shuttle from Red’s Meadow down into the town of Mammoth. In town, there are motels, a hostel, many restaurants, gear shops, and a large grocery store. Mammoth is quite a popular place for tourists in the summer, so it can be hard at times to find any lodging. When we went through on the second thru-hike, there was a motocross competition going on and all the motels were full…luckily we were able to find a condo to rent for two nights that fit six of us. Consider using AirBnB here if there is no vacancies. Going fast – Possibly send a resupply to Red’s Meadow, but at least stop in to the restaurant for a hot meal and maybe even a piece of pie. Moderate Pace – Take the shuttle into Mammoth for the night. Enjoy the town food and get cleaned up. This another “on trail” stop. There isn’t a whole lot here, but you can get something hot to eat at the grill or pick up some snacks at the general store. The store also houses the post office, where you can ship a resupply package. There is cheap camping, and for the folks wanting to hike Half Dome, the Ranger Station is nearby to request a permit. You can also catch the local bus to head down into the valley, if you want to take a day and explore. Be warned, it is a tourist zoo in the valley. Going fast – Send a resupply package to the post office. Enjoy a meal or snack before heading up the trail. Moderate pace – Send a resupply package and pitch your tent in the campground. Enjoy the National Park and head into the valley for a “tourist-y” day should you feel the need. Some folks feel that the section between Tuolumne Meadows and Sonora Pass is the hardest of the PCT. All we can confirm is that the mosquitoes are insane in this section. 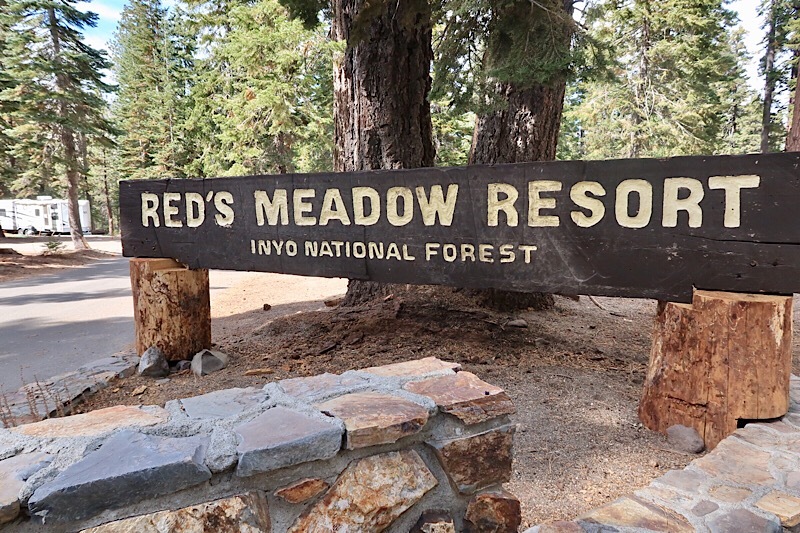 Once you get to Sonora Pass, there is a good chance that you will want some creature comforts which can be found at the Kennedy Meadows North Resort. They have a bunk room (which can fill up quick), cheap camping, showers, a restaurant, and a small general store. They will even mail your bear canister for you, since you are no longer required to carry in on the trail. Make sure you walk through the parking lot at the trail head on the north side of the road – there is often folks with trail magic. Going fast – It is a pretty long carry from Tuolumne Meadows all the way to South Lake Tahoe, so you may want to consider sending a resupply package here. You can just hitch in, pick up your package, do some quick chores and hitch back to the trail. Moderate pace – Spend the night, get a hot meal and take a shower.